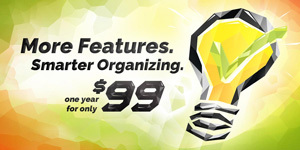 A genius organizer like you deserves top tools. Through June 15, get your perfect plan at our best price — starting at just $99 for a full year. Link multiple sign ups onto one page with tabbing. Build and design customized sign up layouts. Send custom reminders to your sign up participants. Set specific start and stop dates/times on sign ups. Add multiple administrators to your account. Get started with a new plan today! Your sign ups will be smarter, sleeker and better than ever.